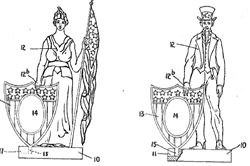 A few patriotic patents for your enjoyment on the 4th of July. The first is a jack-in-the-box featuring a rather creepy-looking Uncle Sam (US978489); next are matching picture frames with Lady Liberty and Uncle Sam–a perfect gift for queen and king who have everything! (US1283100); the third is a bottle shaped like Uncle Sam holding what appears to be a rifle–for taking shots at squirrels and evil doers?! (USD29331); and, finally, two flags inspired by the design of the US flag. It’s surprising how many patent flag designs there are based on Old Glory. See USPC D11/167 and D11/168. 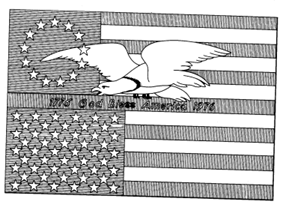 This entry was posted in design patents, Independence Day, Uncle Sam. Bookmark the permalink.